The Rio Rapids Soccer Club is part of the Colorado Rapids adidas Alliance Program. The adidas Alliance was established to create a working relationship between existing youth soccer clubs that will benefit soccer development through shared resources between the Colorado Rapids MLS team, the Colorado Rapids U.S. Soccer Development Academy teams and member Clubs. As a member of the adidas Alliance, our players will have direct access to elite player pathways and programming in the Colorado Rapids U.S. Soccer Development Academy and the Colorado Rapids Youth Soccer Club through direct coaching, player scouting and training opportunities. 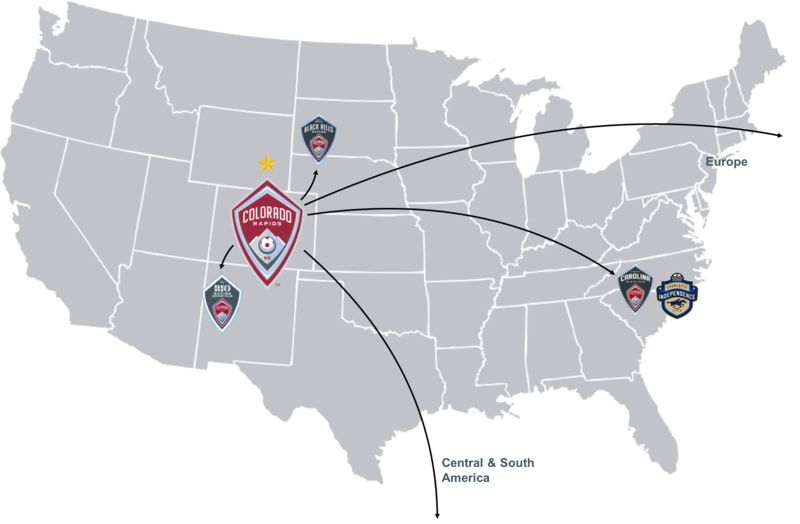 In addition, the Club will benefit from access to the Colorado Rapids curriculum and the sharing of best practices in a multitude of areas between members of the adidas Alliance. Rapids adidas Alliance clubs will also have exclusive access to on-field and in-stadium educational events with the Colorado Rapids. Rapids Academy director Brian Crookham is one of our favorites to speak with here at Burgundy Wave. I caught up with him after the MLS Draft, here’s part one of our conversation. We absolutely love talking to Brian Crookham around here. The Rapids Academy director has always been willing to share a word or two (thousand) with us over the years, and I caught up with him again after the MLS draft to talk about the academy, some of the players in it, and the affiliates that the Rapids are getting around the country. I’ll start off by asking about the Carolina Rapids a little bit, because I’m not completely sure about how they fit into the Rapids organization. What benefits do those players get being a part of the Carolina Rapids and could those players someday work their way into the Colorado Rapids first team? Yeah, so what we’ve done is, we’ve got a very defined curriculum and education programs that we have developed basically to deal with every aspect of things that influence all the factors in a player’s development. So traditionally, clubs have done a good job in coach education, where they get their coaches on the same page and move forward with that. For us, there’s other things that influence the administration, how things are set up. As a club, the parent education and having them understand what the players are going through so they become translators for the message of player development. We also have events, like this summer we had two Carolina Rapids boys go with our group that went to Costa Rica. We had a couple of Vegas kids, a couple of Carolina kids in there so there are some playing opportunities involved. We’re looking at the ability, as we start developing USL relationships, we’ll be looking to expose them to the exact same things that we’re exposing the players that are in Denver to, and then they’re a part of our development path. So yeah, it’s our goal to bring those guys in and have them a part of what we’re doing all the way to the first team. Do they recruit mainly locally, kids from their area of North Carolina in there? Absolutely, yes. They’re based in the Charlotte area and they’ve got their own little catchment area. They’ve done a good job and philosophically I think that the club is extremely well organized all the way through. Do you put a lot of emphasis on trying to look at kids from the Rush and the Real Colorado Foxes for potential homegrown status? No, I mean those guys are doing their own thing and players that choose to be in that environment, which is slightly different from what we do, sometimes it’s a better fit for kids. We’re interested in kids that are interested in our philosophy and our pathway, and if you look at the draft today or the combine group, you’ve got two boys, (Patrick) Slogic and (Zach) Bolden, that were in the combine who were in our group and homegrown eligible for us that we decided not to sign directly out of college. They’ve chosen that pathway. You’ve got kids like (Robert) Derschang and Tesho (Akindele) who have played with us at different points. They played at MLS events with us, but they chose to stay with their clubs instead of going into the development academy route with us. You’ve got Venter who was a Real kid all the way through and did a great job. So there’s enough players and enough different motivations that all of these clubs can be supported. In some youth sports, there are seven or eight practices a week. I understand there are three per week for the Rapids academy, and you can correct me if I’m wrong there. Well, we’ve got the guys in five days a week. So it may be three days of training with double weekend games because of our geography or it may be four days of training and a game on the weekend, it may five days of training if we don’t have a game that weekend. So we’ve got five days of training activity. As the resources get better, will that increase to six or even seven a week? Is it a matter of resources at all? I don’t think it’s a matter of resource. I think it’s about workload and balance and everything. Unless we had a residence hall where we could put them and not have to import them every day, I think until that happens we might get a six day a week schedule but we’re mindful of the fact that these are kids who have to get an education and have to grow up and do all that. So we’ve got to be holistic in the way of looking at it. Jamie Smith moving to the academy after retiring got me thinking, what’s the coaching situation with the academy? Does each age group get its own coach, or even its own complete staff? We’ve had somebody assigned to every team all the way through. This year was a little bit unique where Steve Cooke was doing a lot of work with the first team, I was doing a lot of work back and forth whether it be with the first team, with our alliance club, or with some of the other projects we have in the club, and so Steve and I to this point were trading off our work with the 18s. So now we’ve been able to solidify that situation and bring Jamie in as the full-time coach for that group. Mitch Murray will continue with the 16s right now and Gary Evans has got the 14s. Colorado’s in an absolutely huge area of the country with, really, nothing around it. There’s very little coverage from other soccer teams. And it’s in an area where it doesn’t seem likely to get pegged by MLS any time soon, areas like Wyoming, the Dakotas, Montana, New Mexico. Have there been any thoughts of setting up ‘branches’ of the Rapids academy in the bigger cities of those areas to try and foster a soccer culture, the same way that RSL did with their Arizona academy? I don’t know, I don’t necessarily think we’d want to set up a residential academy outside. What we’ve done is, we’ve very strategically looked at our partnerships so partnerships out of our state need to have, number one, philosophically we need to be in line with our partners. We’re very interactive, and we don’t do branding exercises. So, we’re in, for instance, Carolina or Albuquerque or Las Vegas. We’re there four times a year, standing there and we’re talking to those guys every day. So our biggest thing is quality control of our relationship. Do we have someone who is philosophically on board that we can service by being there and going step in step with them? And at some point we need to have access to the first team for those guys. Like you said, if it’s South Dakota or Wyoming, they’re obviously within driving distance and they’re in our geography. Same thing with front range type stuff with Albuquerque, that works. We’ve established that relationship with Las Vegas, the game that we’re playing has come to fruition because of our relationship out there. So we can bring first team players into the market and we’re looking at doing similar type things in Carolina. So while we have an interest in being in some of those other areas, it has to be something that’s serviceable and something that’s a real relationship. It can’t be a paper relationship or a branding exercise. So it’s usually less about geography and more about being a fit with the club when it comes to getting affiliates? Yeah I think geography certainly plays into it, and the relationship with Carolina is obviously unique because of the geography, but I think everything else is pretty easily accessible. We definitely will take that into consideration, but in the end we have to be interactive or it doesn’t make sense. Are there plans to expand, I don’t know if ‘aggressively’ is the right word, but expand like you did with Carolina across the country? No, there’s no plans, but we’ll look at every opportunity as it comes up and evaluate our ability to be effective in that market. Is there a point where it comes down to spreading the resources too thin? Absolutely. We won’t go there. We can’t have a bad relationship out there. We have to be step in step with those guys and if we can’t, we won’t do a deal. This changes a bit with Oscar Pareja out of the team a bit, but back when he was originally with Dallas and their academy, they had some kids that came in from places like Mexico. Did the Rapids, even when Oscar was here, look around Mexico and central America for youth prospects? We have not looked at foreign recruitment. One of the biggest things for us now in youth development is that FIFA has tightened things up on player passes and it’s very difficult to get an ITC on a youth player. And to be honest with you, I think it makes more sense for us to invest in Colorado kids. That doesn’t mean that we won’t look to take on board a kid in a situation that works, but our interest is taking those kids that are within the shadow of our stadium and giving them an opportunity to play for the club long term. Since the collegiate season is only about about three months long, how do you make sure that your college players are still fit and developing throughout the entire year compared to other kids who immediately turn pro at 18 and get thrust right into a pro team environment? It’s a great question because at some of the higher level schools, they’re able to get them in with strength and conditioning guys and they’re able to stay on top of that all the time. But it’s still inconsistent in the college game, so we’ve been able to bring some players back in the summers and have them be a part of our training whether we train them as a separate group or whether we have them training with our first team at times. You know, we’re developing that. What we’re looking at for the future is the ability to maybe put those players into a USL or PDL type set-up so that we’ve got more consistency in the way that we deal with the players in that 18 to 22 gap that we have right now from a service standpoint. Tell me a bit about Andrew Epstein. The pick of John Berner obviously makes it so that there’s not quite as much of a need for a ‘keeper right now, but how soon do you think that he might be knocking on the door of the Rapids? Andrew’s a talented kid. He’s a very intelligent kid too, and he’s in a great situation with Stanford where he’s going to get quality games, and he’s going to continue down that educational path he’s rightly earned and invested in. So we’ll watch that year by year and look at it, and with goalkeepers, especially since they develop later on, you’ve got a little bit longer of a leash on those guys. We’re watching every one of those kids in college and their development, and there’s a lot of things that go into that. I think we ask you this every single time we talk, who do you think is the next big name to watch that will storm into the Rapids like Shane O’Neill and Dillon Serna did? You know, we’ve got a couple of very talented boys that have been in National team groups recently. Right now our probably highest profile kid is (defender) Quentin Pearson. He’s done well, he’s 16 age eligible but he’s playing in our 18s full time. We’re looking at stretching him even more and getting him more time with our pros as spring comes along, as training camps come in and all that. You look at a kid like Q and you see a lot of great qualities. He’s just come back from the U-18 national team camp where he’s done well by all accounts. So you know, we don’t always know who that next one’s gonna be but certainly, players like Quentin have been good. 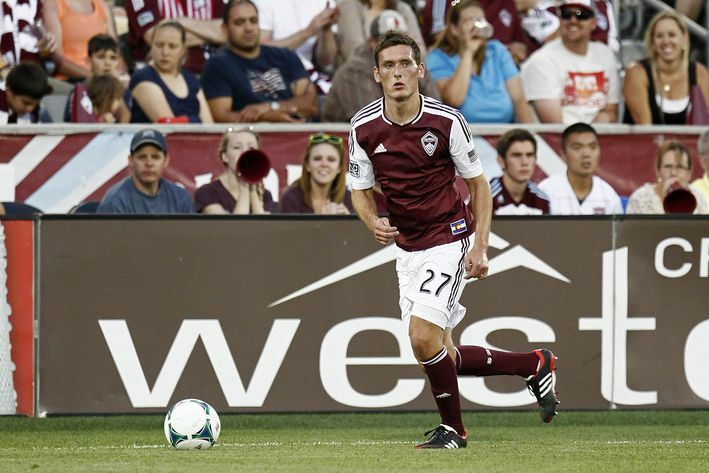 About the Davy Armstrong situation, he was obviously the big first homegrown signing back in the day, but since then the Rapids have seemed a bit slow at bringing in academy players compared to some teams like FC Dallas who bring them in bunches. Is that an organizational thing where they make sure they’re fully ready for first-team soccer before bringing them in? Our typical kid in our academy has the educational path available to them and the professional soccer path if they’re talented enough and motivated enough. So for us, we need to make sure that we’re helping a kid make the right decision. You know, in Davy’s case I think it was the right decision at the time. He played stylistically, our head coach, he fit in with what Gary liked and wanted. You know, we’ve now changed head coaches and Davy has had some horribly-timed injury problems as soon as you get close. So I think some of the frustrations with Davy are totally out of his hands and aren’t based on the same factors that we based that decision on at the time. Having said that, we have a full-club philosophy now so a player is going to have to fit that philosophy from Paul and all the way through the group, we’re on the same page every day about what a player today needs to look like. And that will fit the next head coach and the next head coach so I think going forward, we’re going to be very consistent in what we’re looking for with those players. We have been cautious about signing players because we don’t intend to sign players just for a PR stunt or for anything like that. Players need to be prepared to go, I think. You might see, as we get these USL relationships rolling and get a USL-PRO affiliate then it might be easier to assume we’re going to get players in and get them playing time. And it might alter slightly how we approach those players who are on the border of getting in. That brings up one more question, are there plans to pick up a USL-PRO affiliate this year? Colorado Springs would seem to be the obvious choice for the future USL-PRO relationship, but is there any thought to getting an affiliate this year and perhaps sticking with them and letting Co. Springs do their own thing? We’re not in a place to discuss names right now but we’re very far and it’s going to fall under my realm that we’re definitely working quickly towards solidifying a relationship in USL-PRO. I think that the likelihood is, especially with CBAs coming up, what we’ll look to do is have a partnership that will be in full effect in ’15, and through ’14 we’ll have a good relationship. And when we do go into a USL relationship, we’ll go in with both feet. We’ll have resources investedi n our partner club to assure that we’re assisting them to help create the environment that we need from them. Because as you know, from a club philosophy, youth players and young pros are an important piece of the way we look at our business. So we’ll make sure that the situation is right before we get in. Thanks again to Brian for having a chat with us, it’s always a joy to speak with him. They looked for an organization that had similar goals and values that they have in their youth programs. They are geographically close, but what matters most is that we are a good match – we share the same values, goals and philosophies on youth soccer development. The two organizations were a natural fit when you look at them matched up with our focus on competition, character, community and commitment. What’s in it for them (The Rapids)? Involvement with grassroots development of the sport is very important to the Rapids. The US is a vast country only covered by 19 MLS clubs (Will be expanded to 24 Teams by 2020) so being able to provide a clear path to the top of the sport, both on the boys and girls side, for players not in an MLS market is important. They also feel that it is equally vital to provide platforms where players of all commitment levels can still play, develop and enjoy the game at a level appropriate to their abilities. Is there an increase in fees? No, The Rio SC Board felt very strongly that this partnership should not impact the membership fees paid by Rio Rapids Soccer Club families. What is the Adidas Alliance? The Adidas Alliance was established to create a working relationship between existing youth soccer clubs that will benefit soccer development through shared resources. As a member of the adidas Alliance, our players will have direct access to the Rapids Development Academy through visible scouting and direct coaching and curriculum ties. Is this really just a marketing exercise for The Rapids? The Rapids bring experience in this type of partnership. We already have access to curriculum, player tracking and evaluation forms as well as other resources already in use throughout their player development system. Other resources such as coach and parent education materials and presentations are also already in use. The Rapids have also contractually committed to working in the market multiple times per year. This is more than a paper relationship. Did the Colorado Rapids “buy us”? Are they “sponsoring” us? No. The Rapids did not purchase us. The agreement we have reached is a long-term strategic partnership to work together to better develop soccer players in our area. We will continue to operate as a separate entity with our own bylaws, articles of incorporation and Board of Directors. Will the Colorado Rapids first team come out to NM to play? Yes. We have the option to host the first teams, both the men and women’s teams. They already played at UNM Stadium in 2013. It will be a continued focus and a big part of what we want to accomplish – bringing professional soccer to our community. Does this agreement affect our non-profit status? It will not affect our status or the business structure of our club. We will continue to operate as a non-profit organization. Will the Rapids be involved in our day-to-day operations? Our day-to-day operations will continue in the same way. The Rapids administrative staff will not actively be involved in our customer service or business processes. We do look forward to sharing best practices in back-office operations and parent education and hope to learn from them as we move forward. Does it affect the jobs of any of our staff members? There are no impacts to current roles at the club. Will my team get a chance to go to Colorado to train? It is our intention to identify appropriate age groups, based on developmental purposes for training/soccer trips to Colorado to experience professional soccer in our own country. There are still logistics to work out, but our hope is to expand the volume of teams that have an opportunity to travel for this unique experience. Will we need to purchase new uniforms this year? In an effort to be sensitive to the expenses associated with uniform purchases for our members, we will be continuing in our current kits for the 2013-2014 season. We will be rolling out new uniforms on the next scheduled uniform cycle, the 2014-2015 season for those teams schedule to buy new uniforms (2 year cycle). In the meantime, we’re working to obtain patches to add to our current jerseys to identify ourselves with our new brand. More information about this will come shortly. This sounds great for the Boys program, but what about the Girls program? What’s in it for them? We see this agreement as being beneficial for all areas of the club. In addition to the Colorado Rapids men’s team, they also have a Women’s team that plays in the W-League and a Women’s Reserve team. They have showcases that spotlight elite players – both genders – that extend the geographic reach of their opportunities to be seen by college coaches. Other benefits include curriculum, coaching staff growth and collective knowledge of the Rapids and adidas Alliance club staffs. This sounds great for the “elite” player, but what about the rest of our players? In short, when our coaching staff improves through additional professional development opportunities, the experience for all of our players improves. Our competitive team coaches will have resources and training opportunities available to them through this agreement that will enhance the experience for all of our players. My child is in the Youth Academy program. Why should I care about this? From a soccer-focused perspective, we will be reviewing our curriculum for our Youth Academy players as well. New resources and access to best practices now available to us will enable us to continue striving to make our youth academy soccer experience the best it can be. How will this affect the Rio SC name? We are very proud of the Rio Soccer Club that we all created. As we’ve grown and evolved, our footprint and brand has expanded beyond the Albuquerque area. We have members from many parts of New Mexico. The name of the club is not just a name, but it represents a culture, community and philosophy. We want to be inclusive to all parts of our community that we serve and keep the “Rio” piece of our name. What do we do with our old gear? Until the next uniform cycle, you’ll need to continue wearing it! Once we replace our kits, you may want to keep pieces for nostalgic purposes. However, we have been long-supporters of gear donation to folks who are in need of uniforms, shin guards, cleats and balls. We will continue to support these efforts and we look forward to providing many opportunities in the coming years to give all of your gear a new life with kids and communities that need it! What are our new colors? What will our team names be? The primary colors of the new logo are burgundy, blue and grey. As always it will be up to individual teams to choose their team identity and names. Will our kids still play in the NMYSA leagues or will you be moving to US Club? This new partnership won’t affect the playing division of your child’s team. If they are due to play NMYSA and/or US Club then they would stay on that course. What is a “Homegrown player”? Are our Rio SC players considered Homegrown Players for the Colorado Rapids? Major League Soccer has created the homegrown player rule to create a clear path from amateur soccer to the professional league while retaining the rights to the players they help develop. The Colorado Rapids identifies their Academy’s top players in each age group as Homegrown Players after spending 12 months following specific curriculum. A Homegrown Player who is talented enough to play in MLS will now have the ability to sign a Generation Adidas contract for his hometown club and not be placed in the MLS SuperDraft. Our Rio Rapids SC players will now be considered in this pool of players for consideration and evaluation. Additional requirements outside our current agreement with the Rapids will have to be met for a player in the club to be eligible for as a ‘Homegrown’ signing.